Earlier this year we got a call from Diocese of Chester. Just before Christmas they had a wall which had collapsed due to a large tree stump between a rectory in Bromborough, Chester and the pub next door. The wall is to be rebuilt but it was felt that removing the stump and lowering the ground level on the Rectory side would be the obvious thing to get done at the same time. Thats where Wainwright Stump Removal came in to help. We where tasked to cut down the 5 foot tall and 5 foot wide tree stump. 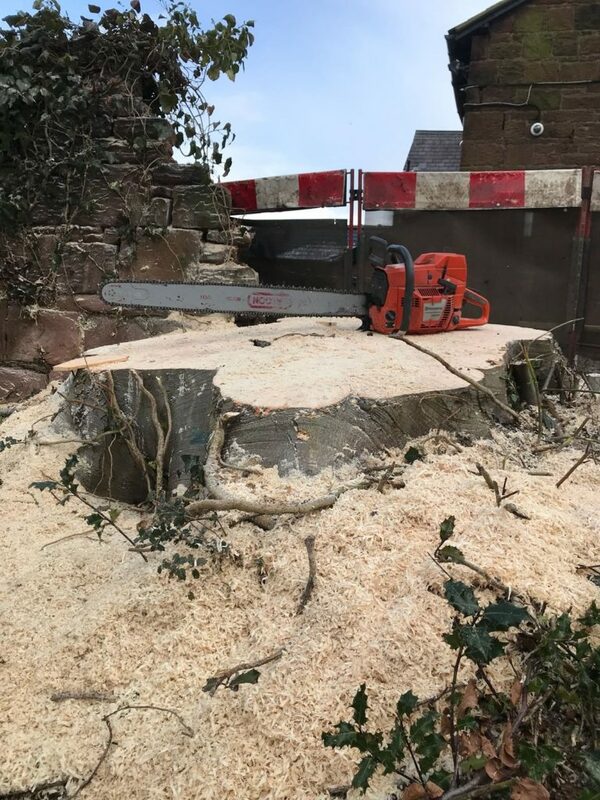 Using our Bandit 2900 Stump Grinder and Husqvarna Chainsaws we cut down the large stump and managed to dispose of the timber for the client, which then went on to our local green waste site at Cheshire Green Waste they ensure all our timber and wood-chip from tree surgery jobs is recycled and used for the most ecologically friendly purposes. As a company policy we do not remove any stump grindings from site we believe the extra cost that other companies charge is comparable to PPI, to us as they have so many uses around your garden! They can be used for a mulch for flower beds or a weed suppressant and more importantly when left in the area where the stump was so that once the ground settles you are not left with a dip in the ground. When Wainwright Stump Removal are finished you are always left with a neat pile of woodchip and soil where the stump once was, the only evidence we had ever been! On Special occasions we do remove stump grindings for an additional cost if you require this then just ask when inquiring. If you have any questions about stump removal please do not hesitate to contact us!